Building paddles is, of course, a necessary part of building a Cedar Strip Canoe. That is my opinion. The last paddle I built was made with eleven pieces of wood; this one is being made with three. One piece, the paddle blank, is from a 5/8"x8"x54" piece of poplar. The shaft strips (2) are 1/4"x1-1/8"x34" redwood. The redwood is epoxied to the blank then the shaft is carved with a block plane and sandpaper. The blade and handle grip are carved with the block plane and sandpaper. Shaping the paddle from the glued-up blank takes a lot of planing and sanding. The paddle is clamped to the workbench, the blade is supported and the planing begins. My goal is to shape the blade from the 5/8" thickness near where the handle attaches and angle it to 1/4" thickness at the edges. The top of the blade is shaped using an orbital sander so the redwood handle strip comes to a point and tapers to the blade surface. Shaping the paddle from the glued-up blank takes a lot of planing and sanding. surface. Well, it's at least a few years since I built this paddle. 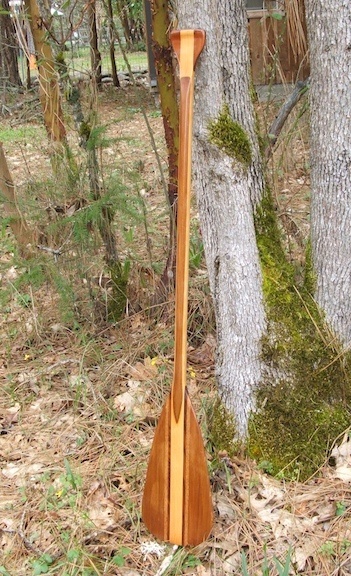 The paddles for my 15'-10" canoe were about 58" long and quite heavy. This one I built at 48" and of much lighter wood. The shaft is poplar and redwood and the blade is poplar, redwood, mahogany and cedar. My new paddle, above, will be the same size but slightly heavier. The finish is three coats of marine grade spar urethane.